Advocates of the proposed United Nations Arms Trade Treaty (ATT) promise that it will prevent the flow of arms to human rights violators. This paper first examines the ATT, and observes that the ATT, if implemented as promised, would require dozens of additional arms embargoes, including embargoes on much of Africa. The paper then provides case studies of the current supply of arms to the dictatorship in Zimbabwe and to the warlords in the eastern Democratic Republic of the Congo (DRC). 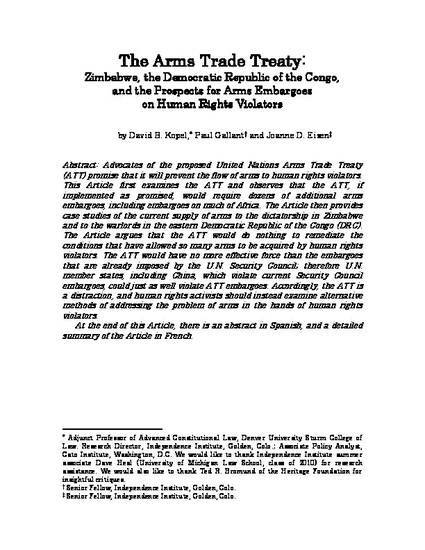 The paper argues that the ATT would do nothing to remediate the conditions which have allowed so many arms to be acquired by human rights violators in Zimbabwe and the DRC. The ATT would have no more effective force than the embargoes that are already imposed by the UN Security Council; therefore states, including China, which violate current Security Council embargoes could just as well violate ATT embargoes. Accordingly, the ATT is a distraction, and human rights activists should instead examine alternative methods of addressing the problem of arms in the hands of human rights violators. The paper is supplemented by a lengthy summary in French, and an abstract in Spanish.